Make these 30 delicious meals in 30 minutes or less. With all the planning that goes into back to school time, making sure the kids have all the necessary school supplies, clothes, carpool schedules and more, a lot of the time dinner is often forgotten. I’ll admit there’s been many days when dinner time rolls around and I realize I don’t have anything in the fridge or freezer that takes less than an hour to make so Costa Vida or Freddy’s is what we end up having for dinner. 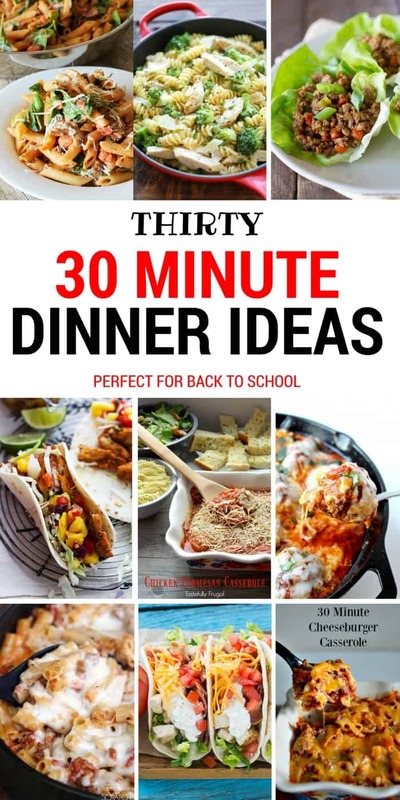 Not anymore; today I’ve rounded up 30 meals that can be made in 30 minutes or less. Make a list of your favorites, pick up the ingredients on your next trip to the store and dinner time will be a cinch! That meatball skillet looks so good! !